I have added a long box to my line of calls. It was well received at the 2010 N.W.T.F. Convention, as it got a first place ribbon. The call is made of walnut with a quarter-sawed Osage orange lid. It has a beavertail shaped handle on the call's main body that is woodburned. The call has that great long-box sound that the turkeys love. 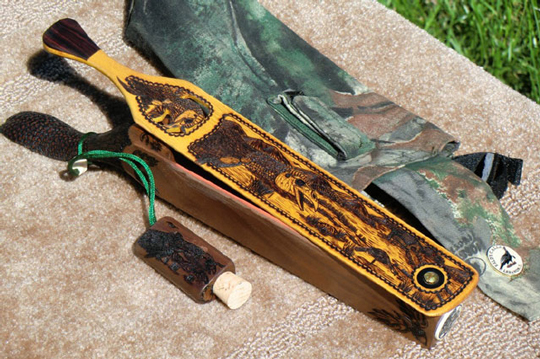 The call can be decorated to suit your tastes and comes with a holster and silencer as well as a decorated chalk box. For more information or prices, please call or e-mail us.